It’s been a tough week for squirrels. The tree-loving rodents can’t handle a foot and a half of snow, and had to pretty much hunker down till a melt – or a crust – makes terrestrial travel safe. Gray squirrels often have it tough. Back in 2004, the acorn crop crashed, and the squirrels had a hard time surviving last winter. Those that did were often weak and more susceptible to predators – including the automobile tire. They produced smaller families, and their population declined markedly. 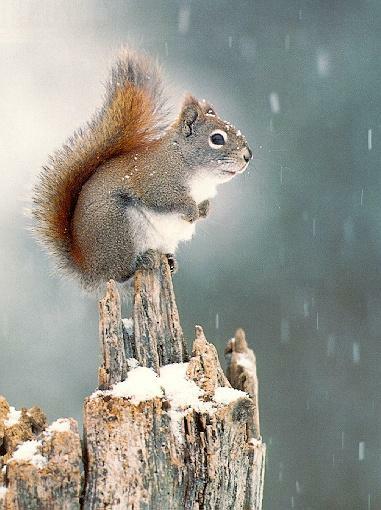 The 2005 acorn crop was reportedly a bit better, and until now, the winter of 2005-06 has been mild, so nature may be giving the Gray Squirrel a break. That may not please folks who battle “tree rats” at the bird feeder or in their attics, but a healthy squirrel population helps keep forests healthy by planting oaks, hickories and other nut-bearing trees. Squirrels also provide food for hawks and owls, and, when they don’t cross at the green, for vultures and crows. In the Southeast where I live, we are already starting to see quite a few acorns on the ground. I think this year's crop will be big. When the acorns are ready, the squirrels quit coming to the squirrel feeder until around January. Normally, they don't quit the feeder until mid to late September. They are starting to slack off now, and its only late August!